I grew up watching Sir David Attenborough on the TV. My earliest memory was Life on Earth, its’ remarkable species and dramatic locations, and the fascinating evolutionary insight that it provided. Life on Earth was pivotal in stoking a growing wonder and deeper understanding of the natural world and the exotic environments and creatures that lay beyond my local Edinburgh environment. The accompanying title music still strikes a memorable chord deep in my psyche today. Subsequently, The Living Planet, and The Trials of Life, introduced me to animal species and environments that continued to amaze and promote my growing interest in evolution and ecology. In 1985 I was privileged to attend an evening event with my dad at the Edinburgh Usher Hall just a few days before my 14th birthday. Sir David Attenborough talked conservation in his lecture “Travels of a Naturalist”, for the Scottish Wildlife Trust, illustrated on the big screen with his own slide photographs (a pleasant surprise). I still remember the excitement of the evening and of seeing and hearing Sir David behind the lectern. I have followed numerous series and documentaries devised, narrated or fronted by Sir David Attenborough over the subsequent years. I watched Sir David on the screen wandering across deserts and standing within tropical rainforests amongst a myriad of other exotic habitats. I observed him in shot alongside amazing animals of one sort or another. I ached to visit such places and experience such animals. Inspired by Sir David Attenborough, and encouraged and supported by my parents (to whom I will always be grateful), I have been lucky enough to touch similar experiences along my own path as a student, researcher and lecturer, as I studied through my Zoology degree at the University of Edinburgh, my PhD at the University of Cambridge and latterly my lectureship at Edinburgh Napier University. 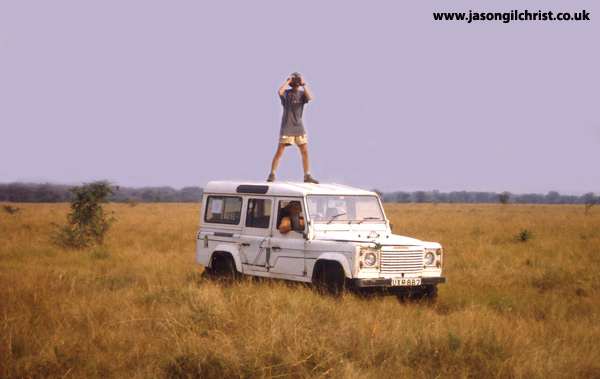 In Uganda, during my PhD field research on banded mongooses in Queen Elizabeth National Park, I found myself living and working in tropical Africa. There I was walking with mongooses, and bumping into all sorts of other amazing (and sometimes dangerous) animals. I appreciated it then, and I appreciate it now; I had made it to where I wanted to be. Like David Attenborough, I got to experience the exotic and fascinating world on the other side of the world. Importantly, I also developed an insight and understanding into the lives of other creatures and how they fit within their environment. Sir David does not just visit places and observe the species; he shares his fascination into how the world worked. As an ecologist, for me, being there is not enough. I want to get my head into the animals, their evolution and their lives. I also managed to visit mountain gorillas. Twice during my field research in Madagascar on grey mouse lemurs I met BBC film crews working on Sir David Attenborough series: Life, and then Life in Cold Blood. For the latter, I got to speak to Sir David’s long-time producer, Miles Barton, and cameraman, Gavin Thurston. I have yet to meet the great man himself, but I felt within touching distance as Miles and Gavin packed their kit upon completion of filming at Kirindy Forest to meet up with Sir David at their next filming stop elsewhere in Madagascar. Nowadays, it is not uncommon for me to see or hear Sir David, or other natural history documentaries and series on the TV visiting some of the places that I have been lucky to visit and even talk about some of the science behind the species that live there. In my lectureship at Edinburgh Napier University, one of the modules that I have taught from the very beginning (indeed one of the few survivors!) is the appropriately named Life on Earth, in which I introduce the taxonomy of organisms to my first year students. Alongside that, my interests and teaching in ecology, physiology, evolution and conservation, and my own research, all owe a debt to the inspiration provided by Sir David Attenborough. Through my teaching, research, photos and writings, I hope that I too can inspire others to take an interest in, and concern for, the fellow species with which we share this lively planet. Thank you Sir David. And Happy Birthday. 90 today. Below are video clips narrated by Sir David Attenborough filmed at my Madagascar study site, Kirindy Forest. To view my own 15 minutes of fame (actually it only lasted 10 minutes...) with the BBC - Vets in the Wild do the mongooses. An Attenborough moment to end with. Me with my dad in the savannah grassland of Queen Elizabeth National Park, Uganda. Another Attenborough moment: the header image of a mountain gorilla (click Blog if you cannot see it) was taken in Bwindi Impenetrable Forest National Park, Uganda.